Born to a noble family, Clare of Assisi was expected to make an advantageous marriage, but instead, she was called to God after hearing Saint Francis preach. She left her family, cut off her long hair and gave up her wealth in order to embrace a religious life. She is usually depicted holding a Monstrance because of an event that happened when soldiers came to raid her convent. Although she was very ill, she had herself and the Blessed Sacrament carried to the convent wall, and she prayed for God’s aid. Her prayers were answered, and the enemies fled. Because Clare was said to have seen an image of the mass on the wall of her sickroom, she is the patron saint of television. She is also the patron of embroiderers, gold workers, laundry workers and those suffering from eye diseases. Patron saint of eye diseases, telephones, and television. 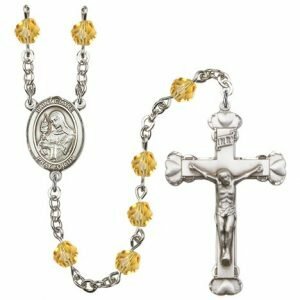 Inspired by the teachings of St. Francis of Assisi, St. Clare ran away her family’s wealth and nobility to live a life dedicated to Jesus Christ as a poor nun. St. Francis guided her as she began her own order of nuns whose mission it was to live simply, growing in holiness and praying for a world in need of God. 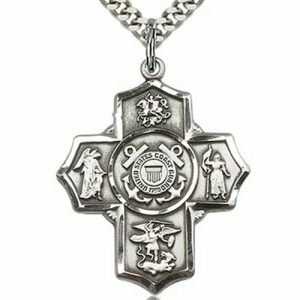 The order she founded still exists today and continues to grow; there are over 20,000 Poor Clares in more than 75 countries worldwide! 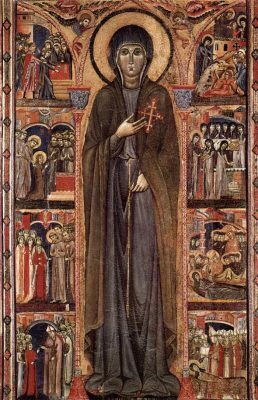 St. Clare was born Chiara Offreduccio on July 16, 1194, the eldest child of Favorino Sciffi (the Count of Sasso-Rosso) and his wife, Ortolana. 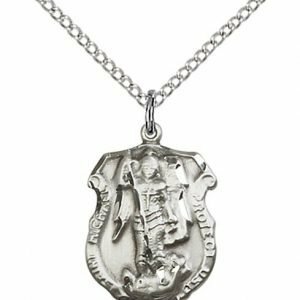 (The name “Chiara” is the Italian version of “Clare.”) St. Clare’s mother was a very devout woman who taught the faith to her daughters, Clare, Agnes, and Beatrix. 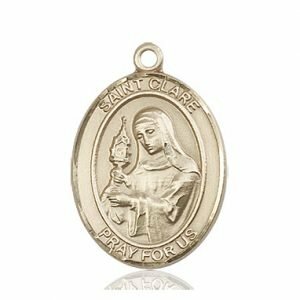 When St. Clare was 12, her parents wanted her to marry a wealthy young man; however, St. Clare told them she wanted to wait for marriage until she turned 18. Yet, when she turned 18, St. Clare heard St. Francis of Assisi preaching and his message touched her heart. She wanted to devote her life to Christ and would not get married. 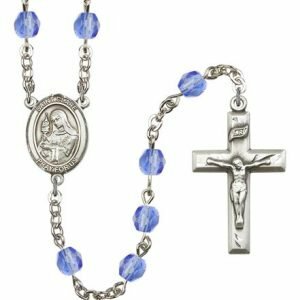 On Palm Sunday, while her family went to collect their palm branches, St. Clare stayed home so that she could run away to live the life she felt God calling her to. 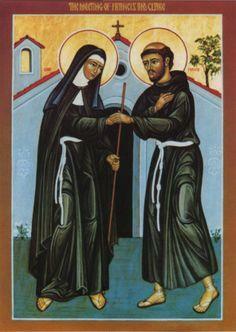 She ran to St. Francis, who cut her hair and gave her a rough brown tunic and black veil to wear. She lived for a short time with a group of Benedictine nuns who kept her away from her father who attempted to kidnap her to bring her back home and marry. Soon, St. Clare’s sister, Agnes, joined her, and they moved close to the Church of San Damiano, which St. Francis had rebuilt. They lived a very simple and poor life, which attracted other women to join them. They wore no shoes, ate no meat, lived in a poor house, slept on the floor, and kept silent at most times. The lack of possessions and luxuries allowed for them to keep their eyes focused solely on prayer and sacrifice. For a short time, St. Francis was the director of this new order (which at the time was known as the “Order of San Damiano”). In 1216, St. Clare accepted the role of abbess, which allowed for her to govern the order on her own, without having a priest as the head of the community. 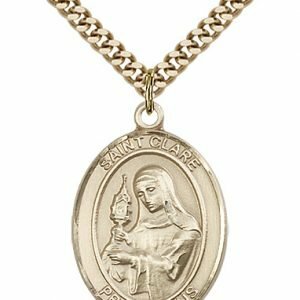 Many times in the following years St. Clare had to hold firm to the way of life that her community lived by, as there were many attempts by Church authorities to get her community to live by the Rule of St. Benedict, which St. Clare felt was too relaxed in comparison to how she felt called to live. St. Clare was determined to live in poverty and simplicity, making only God her priority. 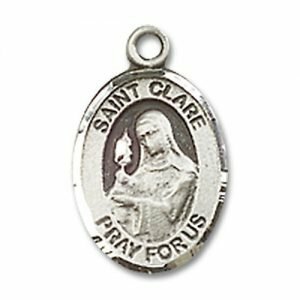 During the early years of establishing her order, St. Clare remained good friends with St. Francis, seeing him as a father figure to her. She took care of him during the last years of his life until his death in 1226. After the death of St. Francis, St. Clare continued to work to keep to the strict way of life that she and her sisters lived by – even to the point of disagreeing with the popes who encouraged her to relax her rule. She stated that “They say that we are too poor, but can a heart which possesses the infinite God be truly called poor?” St. Clare’s heart certainly possessed God, and as such she showed her love for her sisters in everything she did. Though she held the title of abbess, St. Clare served her sisters at table, tended them when they were sick, and washed and kissed their sore feet when they returned from begging. She would get up late at night to tuck in the sisters who had kicked their blankets off. She was the first to rise each morning, and would light the candles and ring the bell to call the sisters to choir for prayer. After prayer, she would leave the chapel with her face aglow. In 1244, Emperor Frederick II, who was at war with the pope, entered the Assisi area to attack it. One of the first places he was to stop was at San Damiano, where St. Clare and her sisters were living. St. Clare had been very ill; yet, upon hearing of the invasion, rose from her bed to do what she could to protect her sisters. As the soldiers were scaling the walls of the convent, St. Clare took the Blessed Sacrament and asked to be carried out to the gate, in the sight of the attackers. St. Clare prayed for the protection and safety of her sisters, and heard the voice of God tell her that they would always be in His care. Then St. Clare prayed for the city, and again was reassured that it would be under God’s care. At this, St. Clare turned to her sisters and told them to trust in Jesus. Suddenly, terror struck the attacking soldiers and they fled in haste, leaving St. Clare and her sisters unharmed. One Christmas Eve St. Clare was too ill to attend Mass. In bed, she sighed to herself and prayed, “See Lord, I am left alone here with You.” At this, St. Clare received a vision in which she was able to see the Mass as it was taking place, yet from her own room. It is for this reason that many years later, in 1958, Pope Pius XII named her as the patron saint of television, for she had received a “live broadcast” from God. 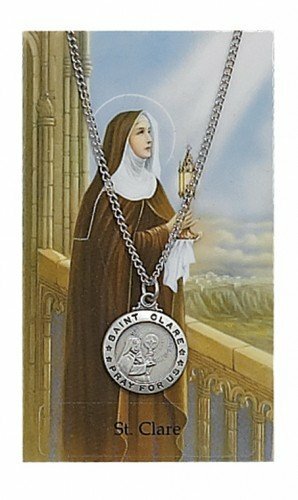 St. Clare of Assisi is the patron saint of those with eye disease, embroiderers, laundry workers, needle workers, telephones, and television. 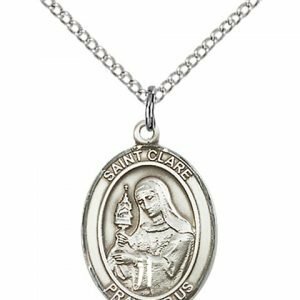 St. Clare’s name means “clear” and “bright,” which is why she has been dedicated as the patron saint of those with eye disease, who may suffer from the darkness of blindness, or various types of unclear vision due to disease. She was named the patron saint of embroiderers and those who work with fabric because of her great talent for stitching and embroidery. She embroidered exquisite altar cloths for the churches in Assisi. She became known as the inventory of “Assisi embroidery,” which is a special type of cross stitch that uses a double running stitch, which outlines the motif, and has a cross stitched background, leaving the motif area void of any stitches. 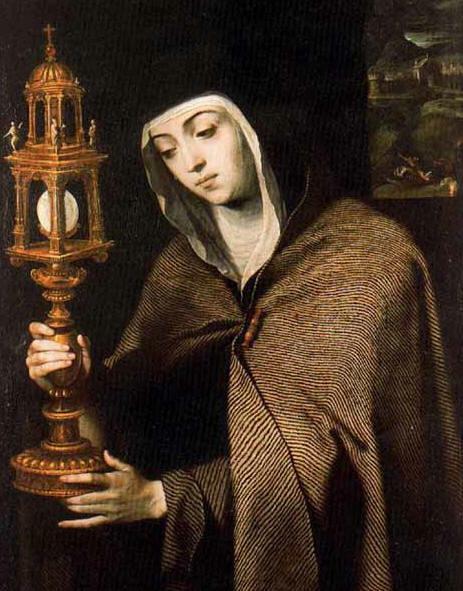 Also, because of a miraculous vision in which, when St. Clare was too ill to attend Mass, the Lord granted her a vision of the Mass as it was taking place, the association between this “live broadcast” and modern-day TV earned her the designation as the patron saint of television. St. Clare, when depicted in art, is almost always featured in one of two ways. The first is in the habit of the Poor Clare (a veil and robe), holding a Monstrance holding the Blessed Sacrament. This image relates the story of when Emperor Frederick II was invading, and as his troops began to attack the monastery, St. Clare held the Monstrance out as protection for her Order, after which the troops retreated and left them unharmed. 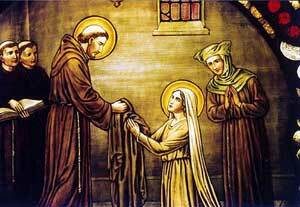 The second most commonly seen image of St. Clare also features her in the habit of a Poor Clare, but instead of standing alone, she is standing with St. Francis of Assisi, her spiritual mentor and brother in Christ. 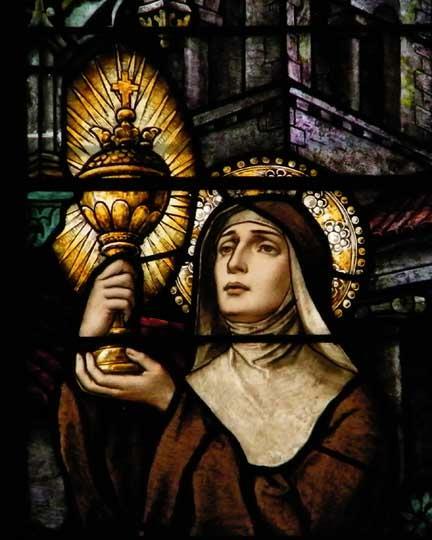 Dear St. Clare, inspired by St. Francis, you became a poor nun for the sake of Jesus, and established the “Poor Clares.” We are told how greatly you cherished Christ present in the Sacrament of the Altar. Is the Mass not a kind of television of Christ’s sacrifice on the Cross? Help all television workers to broadcast the truth and draw away from falsehood and evil. Amen. 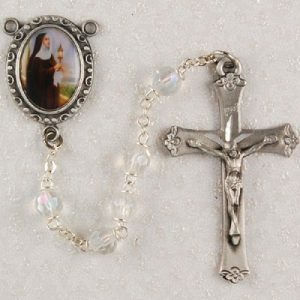 Dear St. Clare, as a young girl you imitated your mother’s love for the poor of your native Assisi. 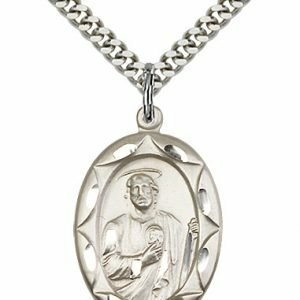 Inspired by the preaching of St. Francis, who sang enthusiastically of His Lord Jesus and Lady Poverty, you gave your life to Jesus at nineteen years of age, allowing St. Francis to cut off your beautiful hair and invest you with the Franciscan habit. All through your life you offered your great suffering for your Sisters, the Poor Clares, and the conversion of souls. You greatly aided St. Francis with his new order, carrying on his spirit in the Franciscans after his death. Most of all you had a deep love of Jesus in the Most Blessed Sacrament, which fueled your vocation to love and care for the poor. Please pray for me (mention your request) that I will seek to keep Jesus as my first love, as you did. Help me to grow in love of the Blessed Sacrament, to care for the poor, and to offer my whole life to God. Heavenly Father, thank You for the gift of St. Clare. Through her intercession, please hear and answer my prayer, in the name of Jesus Your Son. Amen. Inspired by the preaching of St. Francis of Assisi, St. Clare left her family’s wealth and status to live a life devoted to Jesus Christ as a poor nun. St. Francis mentored her as she started her own order of nuns. Her mission was to live simply, growing in holiness and praying for a world in need of God. This order still exists today, 800 years later, and continues to expand; there are over 20,000 Poor Clares in more than 75 countries worldwide!